May 30th wrapped up 7th grade and 4th grade respectively for the Kahuna kids. From the way back machine: the Fox has always been a water bug. WIth spring bypassing the midwest, we are on about the third week of summer weather. 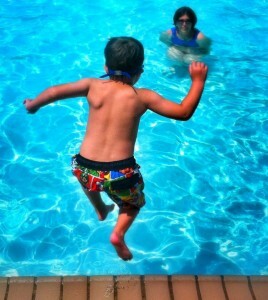 The grass is parched, the pools are the perfect temp and the A/C is on. We headed to our community pool on Saturday, and the guys got their first sunburn of the season. The weather was hot, the pool was inviting and the sunscreen may have rolled under a lounge chair or two, I don’t really know. I refrained myself from reciting the benefits of swimming year round. I didn’t lean over and give her the number to the metro area’s Goldfish Swim School, but I wanted to. Jump Start Clinics start next week and kids get five lessons in a row for maximum mastery. Seriously – don’t drag lessons out for weeks and weeks this summer. Get into a Jump Start clinic and get on with your summer!